Welcome to the artdogspot. View curated media works, artist profiles, interviews, articles on related topics and more. I must sadly report that our featured artist, Jackie Felix, passed away in September after a long ordeal due to complications from surgery. I have chosen to keep this post active through this ordeal in support of her family and those of us who are mourning her passing. It will remain active for the next month or longer. Jackie was an important and iconic figure in our community but more importantly, she was a friend to many including myself. I will miss her greatly. There will be a memorial service for her on November 7 at the Burchfield-Penney Art Center. Please take some time and view her video interview on this site. I consider it fortuitous that we have this document to remember her by. In this post, we profile artist Jackie Felix. This is an artist who works close to the edge creating figurative pieces with content that ranges from the ambiguities within personal relationships – with direct and indirect sexual references – to violence, religion and politics. You know – all the things we are told not to talk about in polite social discourse but, in fact, are the things that motivate us all. In an art world full of works with socially-aware content, what makes her work different from others? It’s her highly metaphorical, at times abstract and theatrical or filmic approach to depicting human interactions. And, it’s also the fact that she has been drawing and painting for a very long time which has made her a master at her craft. Also in this edition, check out the article on three recent film releases and how they inform us about our dysfunctional consumption in Food, Inc., Waterlife, Moon: Dystopia, Here We Come. Check out the works by media artist, Alec Crichton, curated by Adriane Little, Assistant Professor of Photography and Intermedia in the Gwen Frostic School of Art at Western Michigan University. Look for Alec’s video album DING under Curated Projects or on his website at www.crichton.tv. He is also Co-Founder and Curator of www.souvenirsfromearth.tv, the first Cable TV Station exclusively committed to Film and Video Art. Other posts include profiles of artists Bruce Adams and Richard Huntington, under Featured Artists. You will find an in-depth interview with them in which they discuss their art making and experience sharing a studio space for fifteen years. Also other Articles under Film, are thoughts on conceptual artist Steve McQueen’s film, Hunger and two articles by Jeannine O’Brian on current copyright issues in our Related Topics section. This is fantastic and I will definitely add your effort to my required reading. 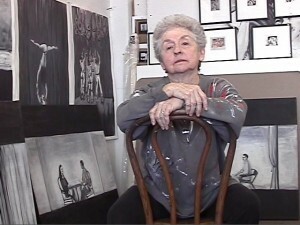 Of course featuring Jackie is so well deserved, she is a keystone artist of the Buffalo community who has influenced the fabric of WNY art for decades. Thanks, Sean. Jackie deserves all our support – as she has done for all of us. Wow. I just spent the best last hour exploring all the intrigues of this web site. I took a trip to NYC, saw exhibits, ate at fine restaurants, talked with real artists, watched edgy videos, learned so much about the lost works, and look forward to the interview with Jackie Felix. Her biography and art are so interesting. Keep up the great work on this site! I plan to be a regular addict. Oh, all the features worked flawlessly. I like the quick and easy downloads since I had so much to see. Susan O’Leary (171 Cedar Arts Center, Corning NY) let me know about your new site and I’m glad she did. Great to see the article about Jackie Felix. Keep up the good work! Yes – Susan mentioned that you might be visiting the site. Glad you liked it. I’ll let you know when we will be posting new projects.